These 2-Disc Jewel Box trays save time and cost. 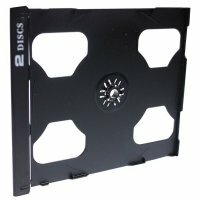 The thin tray can accomodate one disc on each side, back to back. Snaps into the spine of any standard type jewel box and fuctions as a hinged middle panel.